Unlikable characters. Yuki's face is ugly as sin when he freaks out. He's really lame too. Seemed interesting with all the good reviews but I couldn't bother to finish the first episode. The alien kid is way too human looking and I think he is meant to be funny. I do not see why people like this show. A criminally underrated series about aliens and fishing. Have you ever dreamed of an anime focused on fishing with the inclusion of aliens here and there? If so, that's a really specific thought, and one that's kind of weird. But fear not, Tsuritama is here to make those dreams a reality. Being the very definition of 'hidden gem' in terms of anime, Tsuritama brings a lot to the table with hardly any recognition as something great. "Fishing to save the world!" is a perfect description of this series. 17 year old Sanada Yuki ends up befriending an odd boy who openly admits being from a different planet, he calls himself Haru and drags Yuki and a bunch of other characters into strange and often dangerous situations. Fishing may not seem too dangerous or wild at first, but Tsuritama cranks the usually calm pastime up to 100 with the addition of a large threat to the quaint town of Enoshima, where Yuki and many others happen to live. I won't say too much, you'll have to find the rest out for yourself. Bright colours, a charming art-style, wonderful characters and plenty of emotion are all what await you in this underrated series. If you need to relax, then this will satisfy you and rid of all stress that you have. I highly, highly recommend this series to every anime fan out there. I'm slightly disappointed that it doesn't get much attention. This anime is a diamond in the rough! I don't even like fishing and this made me want to start. The main character is a boy with extreme social anxiety, and the growth throughout the series was amazing. All of the characters, in fact, grow a lot and develop in unexpected ways. There is family drama, action, and relationships that are more than your typical everyday friendships. All in all, I'm glad I took the time to watch, and recommend this anime to anyone that is not easily dissuaded by a synopsis that only covers the first episode. such a wholesome anime, just check it out for yourself!! 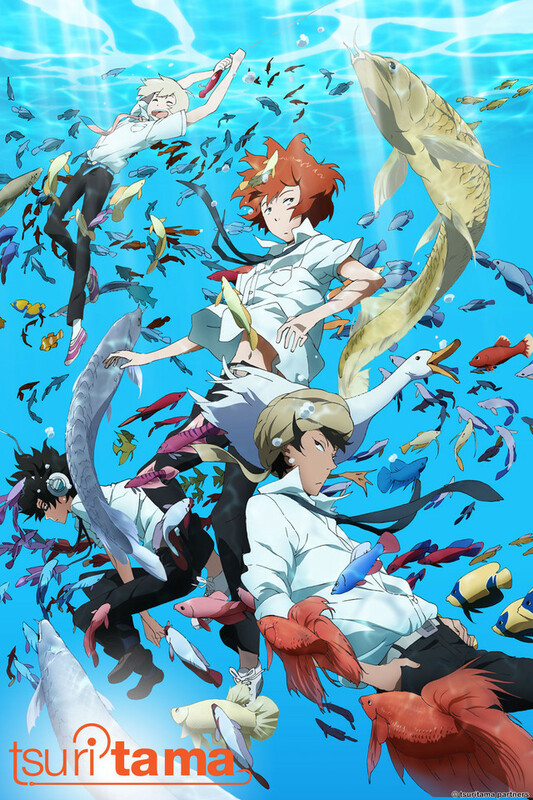 i wasn't sure what I was expecting with a fishing anime, but it was so much better than just a fishing anime, the cover picture lured me in with all the fish and the art style is gorgeous. the music is calming and it's amazing how this cute and funny and dramatic it can get in just 12 episodes. overall, this was an amazing short slice of life series that everyone needs to watch if you're feeling down and need something to smile at! This show is really adorable! While it might be a bit slow in the beginning, I found the characters and story really well done! I also like the representation for social anxiety. The show covers in depth the struggles of coming out of ones shell as well as the struggles and rewards of developing a healthy friendship. Definitely on my rewatch list! Friendship, fish aliens, a guy with a duck. Everybody goes fishing in the ocean. Also dancing I guess. It could only be improved with mermaids, even though the fish aliens are basically betta fish mermaids. WATCH THIS IT IS GOOD. They said the review needed to be longer, so I am writing some nonsense and making it longer. This show is good and you should watch it, and it is good. Also, watch it, because it is good. This is an anime that might disappoint you if you have high expectations of it, but I absolutely adore it! I love this series. It's not the most exciting or mind blowing, but it is definitely unique and very good with the way it handles its characters. I love the colors and character designs done by Atsuya Uki. The visual metaphor for social anxiety was done very VERY well and easily communicates the feeling with it's drowning theme. Bravo! Sorry for the poorly done review. This show hits all the ingredients that can get me to like a show. A beautiful art style sometimes reminiscent of miyazaki films. check. A fun and engaging main cast. check. A catchy opening. double check. The story itself is pretty great as well, even with some iffy pacing at the start. All together this show is just a wonderful stew cooked juuuust right. Just sit back, relax, and enjoy! Tsuritama is a delightful and fun series, exploring the emotional depths of both friendship and fishing. With a diverse cast of characters, a solid plot, and beautiful animation, this anime manages to tell an emotionally satisfying story in only thirteen episodes. This show will definitely surprise you. It's very cute and adorable and upbeat, but at times, it will break your heart. I cried during many episodes. Watching the characters develop is extremely heartwarming, and the ending is fantastic. Definitely worth watching!